The lawyers have won! PM Gilani just finished addressing the country: The Chief Justice will be restored on Mar 22nd, and Section 144 has been repealed. This is the 5th day of the Long March. 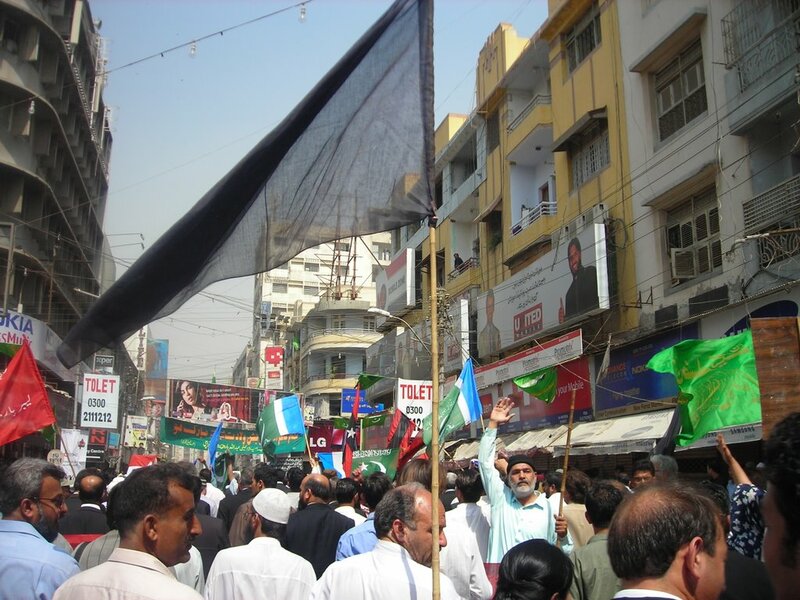 The protests and lawyers movement started in Nov 2007 when Musharraf deposed the judiciary. This is what democracy movements can do towards a progressive Pakistan. Long March Breakthru: Restoration of the Chief Justice? The government appears poised to reinistate the Chief Justice and cede to the demand of the Long March. PM Raza Gilani will be addressing the country shortly followed by Nawaz Sharif. It’s day 5 (Pakistan time) of the protests which began on Mar 12th. ISLAMABAD: In a golden moment in Pakistan’s history, the government has decided to restore the deposed Chief Justice of Pakistan, Justice Iftikhar Mohammad Chaudhry. 3.05 PST: Islamabad-Senior PML-N leader Javed Hashmi, who was arrested earlier in the day, has arrived at Iftikhar Chaudhry’s house. Speaking to the media, he said that he hopes that the PM’s announcement will fulfill the expectations of the nation. Or watch Aaj TV via Live Station or Jump TV. The Atmosphere there is ecstatic.. All the governments plans have gone in disarray..The police has stopped pelting people, they have stopped the tear-gas. Instead HIGH RANKING Police Officials (of SSP rank and above) are coming inside the High Court and making speeches!!! They are apologizing to the lawyers and civil society activists. They are saying that all that is happening is wrong and from now on they wont hurt them!!! Police officials are, in fact, talking and adjusting with the people inside high court!!!! In what analysts here called an unprecedented reversal by security forces, phalanxes of riot policemen here in Lahore melted away rather than continue to confront protesters who had rallied around the opposition leader, Nawaz Sharif, when he defied a house arrest order early Sunday. Lahore’s Chief Magistrate refused to comply with the crackdown. Remember this? In a reprisal of Musharraf’s policies during Emergency Rule in 2007, Pres. Zardari has banned the largest news channel, GeoTV from major sections of Pakistan including Islamabad, Karachi, Lahore, Quetta and Multan. Following the ban, PPP Information Minister Sherry Rehman resigned from her government post. Rehman had held a “a series of heated arguments” with other officials in the PPP, according to Dawn, but after failing to convince them against the ban, she resigned in protest. A prominent member of the PPP, Rehman’s decision signals splits inside the PPP about how to tackle a vigorous press that has been openly critical of the government’s policies towards the Long March. There may be institutional issues at several levels in Pakistan, but the press is working. “The media,” Open Society Institute’s Fawzia Naqvi told us, “has become the most trusted institution in Pakistan.” The statement was borne out in interviews with refugees from the NWFP and Fata who thanked the press for covering the dismal situation in their hometowns and exposing the damage caused by the US drone attacks, the Pakistani military and the Taliban. Protesters have been wending their way to Islamabad for the main rally in small groups. 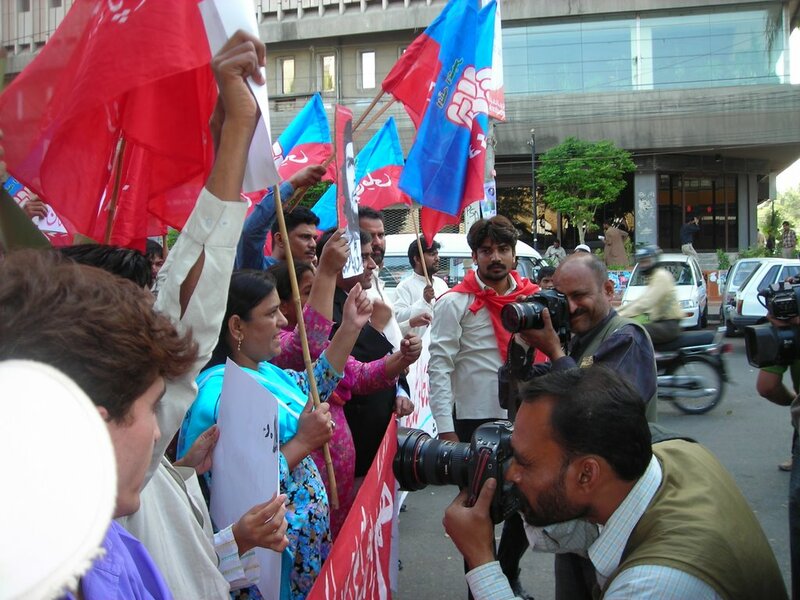 political activists, and civil society members defied section 144 to launch the long march to islamabad. Talking to media, CCPO Karachi said police force is working under specific procedure. Anyone who violates section 144 would be punished and no one is allowed to disturb law and order. Jeena ho ga, marna ho ga! Dharna ho ga, dharna ho ga! Rough Translation: Life or death, the dharna (sit-in) will happen! Protesters are marching towards the capital Islamabad. Activists from Karachi and Quetta are expected to arrive in Lahore on the 14th, and converge on the capital by March 16th for a dharna (sit-in).